It’s been a rough few years for the Waterloo Warriors’ football program since their return in 2011 after a canceled 2010 season, with the team posting 0-8, 2-6, 1-7, 1-7, 0-8 and 0-8 marks since then. But things turned around for them to start this year, with the Warriors getting off to a 4-0 start. Their first three wins came over Windsor, York and Toronto, but their fourth one was a particularly impressive 45-43 shootout win over the Carleton Ravens on Sept. 15. That game saw Waterloo bounce back from a 30-10 halftime deficit despite injuries to platoon quarterback Tre Ford and veteran fullback Mitch Kernick, and it saw their offence score touchdowns on four straight drives. Their defence also came up big at the end, making a crucial stop on a two-point conversion. The star of the day was quarterback Lucas McConnell, who had 29 completions on 43 attempts for 477 yards and three touchdowns, plus five carries for 34 yards and a touchdown. You won't want to miss #BattleofWaterloo next Sat! The rest of the season didn’t go as well for Waterloo, as they lost their next four games and narrowly missed out on the playoffs. Still, this was a great moment for them. And overall, it was a season that suggests head coach Chris Bertoia has the Warriors on the right track. One of the most anticipated men’s basketball clashes this year saw the No. 1 Carleton Ravens go on the road to face the No. 2 Brock Badgers in front of a record crowd of 3,296 fans at the Meridian Centre in St. Catharines on Dec. 2. And the game lived up to the billing, with Carleton leading 19-14 after one quarter and 39-31 at the half, but Brock bouncing back after that. The Badgers cut the lead to three points entering the fourth quarter, and led by six at one point in the final frame, but the Ravens tied it up at 66 and sent the game to overtime. Carleton eventually emerged with a 80-75 win, but this was an impressive showing from Brock, who became the first team all season to take the Ravens to overtime and the first to lose to them by less than 14 points. Dani Elgadi led Brock with 16 points and 16 rebounds, while Cassidy Ryan had 20 points and five rebounds. For Carleton, Munis Tutu had 14 points, five rebounds, three steals and three assists. It was a remarkable year for the York Lions’ field hockey team, with the highlight coming when they claimed their first OUA title since 1996 with a 3-2 victory over the Guelph Gryphons Oct. 29. OUA co-MVP and rookie of the year Jaslan Stirling once again shone for York, notching two goals (including the game-winner in the 43rd minute) while Sydney McFaul also scored for the Lions. York went on to nationals against the UBC Thunderbirds, where they lost both games 2-0. One of the highlights of the hockey calendar so far came in the preseason, with the Guelph Gryphons and Brock Badgers facing off in the 17th annual Steel Blade Classic on Sept. 15. The crowd of 4,974 that showed up at the Meridian Centre set a record for both the Badgers’ highest attendance at any sporting event and the highest attendance at a university hockey game in Ontario. There were plenty of neat touches, too; the game celebrated 50 years of Badgers’ hockey, with the team wearing retro jerseys and many alumni from the first team in attendance. But the Gryphons spoiled the Badgers’ party, emerging with a 5-3 win thanks to goals from Michael Stevens, Trevor Morbeck, Cody Thompson, Scott Simmonds and Seth Swenson. Heading into nationals, many thought the Quebec team to lift the Gladys Bean Memorial Trophy might be the defending champion Laval Rouge et Or, who went 12-0-2 this season, were ranked No. 1 in the Top 10 each week and entered nationals as the top seed. But Laval was upset in the quarterfinals by the Western Mustangs, and it wound up being the sixth-seeded Montreal Carabins who shone, recovering from their 1-0 overtime loss to the Rouge et Or in the Quebec finals to beat the Guelph Gryphons 1-0 in the national quarterfinals, down the Trinity Western Spartans 5-0 in the semifinals and edge the Cape Breton Capers 1-0 in the final on Nov. 12. Catherine Proulx scored the tournament-winning goal for Montreal and was named match MVP, while keeper Claudia Dube-Trempe recorded three straight shutouts and defender Marie-Ève Bernard O’Breham was named tournament MVP. The women’s cross country world saw a big shakeup this year, first in Ontario and then on the national stage. The Guelph Gryphons had won the last 13 OUA titles and the last 12 national titles, but the Queen’s Gaels claimed this year’s OUA championship Oct. 28, with the University of Toronto Varsity Blues finishing second. Queen’s was led by Branna MacDougall, who placed first overall on the women’s side in the 8-kilometre race and was named OUA MVP with a time of 27:19.5. And at the Nov. 12 nationals, the first time that event had been held at an 8-kilometre distance the Varsity Blues came out on top, with Queen’s placing second and Guelph third. Toronto’s Sasha Gollish placed first with a time of 27:37, with Queen’s Claire Sumner (last year’s individual champion) finishing second in 27:46 and MacDougall finishing third in 27:51. The Capers made it to the national final on both the men’s and women’s side this year, and they came away with gold on the men’s side. That was an appropriate way to cap an unbeaten season. But the Montreal Carabins didn’t make it easy for them; Cape Breton beat the UQAM Citadins 3-0 in the quarterfinals and the host Thompson Rivers WolfPack 4-2 in the semis, but wound up in tough against the Carabins in the Nov. 12 final. Stuart Heath gave Cape Breton a 1-0 lead on a 27th-minute penalty, but Mouad Ouzane responded for Montreal in the 69th minute, and that led to the game going to extra time. In overtime, things looked very good for the Carabins once Heikel Jarras scored on a penalty six minutes in. 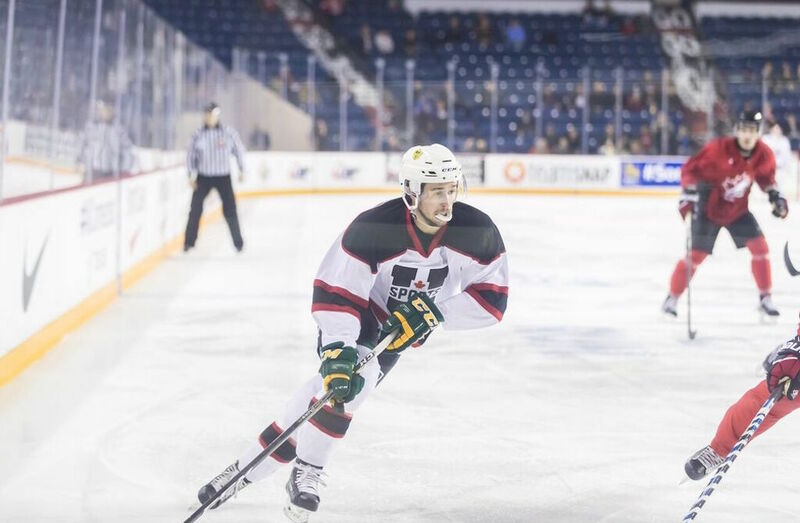 But Cape Breton’s Max Raab responded with some individual brilliance 21 minutes in, sneaking through two defenders to score, and that paved the way for penalties. It took seven shooters each to decide the game, but the Capers’ Daniel Prichard wound up scoring the crucial penalty, and keeper Ben Jackson made the decisive stop. The Sept. 29 Panda Game between the Carleton Ravens and Ottawa Gee-Gees was a crazy one, with the 1-3 Ravens knocking off the 4-1 Gee-Gees 33-30 in double overtime in front of a sold-out crowd of 24,420 at Ottawa’s TD Place. The game was back and forth throughout, with Carleton leading 13-0 at one point in the second quarter but Ottawa leading 21-16 after three frames. A Ravens’ win seemed assured after Carleton DB Jay Dearborn forced a fumble from Ottawa QB Alex Lavric on a third-down gamble with 51 seconds left and Ravens’ DB Justin Howell recovered, but Carleton then couldn’t get a first down, and a muffed snap on the punt put the Gee-Gees in great position. Kicker Lewis Ward eventually hit a field goal from 45 yards out to send the game to overtime. The first annual Rowan’s Legacy match was played Oct. 7 in Ottawa, part of the Gee-Gees’ efforts to honor Rowan Stringer, a n Ottawa high school rugby player who had planned to attend the university but died at 17 in 2013 from second impact syndrome after suffering multiple concussions in a short period. The Gee-Gees also announced the creation of a bursary in Stringer’s name. And the game itself was a great one, a rematch of the 2016 national final where St. FX came out on top. This time around, Ottawa came out with a 33-19 win thanks to a 19-0 run in the second half. Five different players recorded tries for the Gee-Gees, and fifth-year centre Emma Sandström made four of five converts. This game proved even more interesting in retrospect, as Ottawa would go on to win the Monilex Trophy at nationals, becoming the first RSEQ team to ever win that title. They beat conference opponents Laval (who upset St. FX 23-0 in the semifinals) in that Nov. 5 final. There were plenty of great moments in the U SPORTS football playoffs this year, but the Canada West Hardy Cup final on Nov. 11 may have been the most spectacular. A shootout between the Calgary Dinos and UBC Thunderbirds saw UBC leading 43-41 with just two seconds left, and the Dinos a long way out. 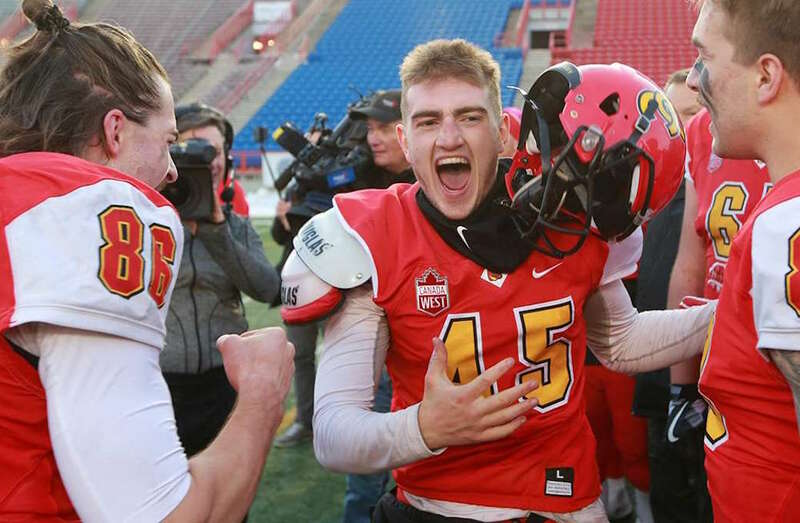 But they opted to try a field goal anyway, and second-year Calgary kicker Niko DiFonte nailed it from 59 yards out, setting a U SPORTS record and giving the Dinos a 44-43 win. There was a lot that led up to that, including four fourth-quarter lead changes and a 92-yard UBC touchdown drive inside the final two minutes. 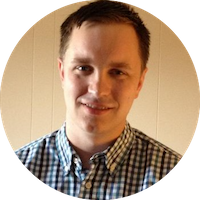 But the field goal was particularly special; the previous best in U SPORTS history was a 57-yarder from Saint Mary’s Huskies kicker Jerry Foster back in 1986, and there have only been only four field goals from 59 or longer in the CFL’s history. For DiFonte to make that kick in that moment, with so much on the line, was the most memorable moment of the U SPORTS fall term.